"You really need to consider the message that you're sending these boys. It's the same message we as a culture send to our pro athletes, which is that they are above the law." Practically every film critic described Coach Carter as an urban Hoosiers during its theatrical run. There's a lot of truth in that statement, but it also ignores some significant differences between the two basketball dramas. While it is impossible not to think of the significantly more memorable Hoosiers while watching Coach Carter, it is also impossible to ignore how vastly different the tone of the two movies are. The real life Ken Carter made national news in 1999 when he locked his undefeated basketball team out of their gym until each player's grades improved. Vaguely remembering the story, I can easily see how it would catch the eye of a Hollywood producer. Screenwriters Mark Schwan and John Gatins use this engaging news story as the basis for a gripping drama and Samuel L. Jackson star vehicle. Perhaps its themes are a bit obvious—after all, most people will readily agree that high school athletes are students first and foremost—but in a world of aggressively ambitious talent scouts and inner-city youths abandoned by their own education program, perhaps such a movie is necessary. As Coach Carter, Samuel L. Jackson delivers one of his best performances since Jackie Brown and proves once again that he is among the very best of American actors. The no-nonsense Carter takes over the dysfunctional Richmond High School basketball team, filled with undisciplined boys who waste their talent and have a record to prove it. Things change quickly, though, when Carter starts making his players work on their fundamentals by running suicides and punishes their disobedience by assigning pushups like a traffic cop hands out speeding tickets. Not even his son, Damien (Robert Ri'chard), is exempt from this harsh coaching after transferring high schools in order to play for his father. Initially, the players resent Coach Carter's reign, but their wins begin to stack up and all the players learn the value of teamwork and become mini-celebrities within their high school. Unfortunately, many of the players have not lived up to their signed contract with Carter, where they all agreed to attend class and maintain a GPA of at least 2.3. Outraged at the indifference his players have toward going to college in order to provide themselves with more realistic life opportunities than playing in the NBA, Carter cancels practice and all scheduled games, thereby drawing the wrath of parents and the school board. I won't explain what happens from this point on, except to say that some plot devices follow the against-all-odds formula to a T (complete with exciting game sequences and emotional confrontations that tug at your emotions) while others are far more realistic and heartbreaking. The filmmakers succeed at staging intricate games and the heartfelt direction generates a compelling story, despite some obvious shortcomings in the script. Namely, there's too much basketball and not enough character development. Apart from Ken Carter, none of the other characters ever become interesting in their own right. The storyline of star player Kenyon (Rob Brown) and his pregnant girlfriend, Kyra (Ashanti), comes in and out of the plot sporadically and is resolved unsatisfactory in an abbreviated scene that raises far too many issues that don't mesh nicely with the overarching themes of the film. The script also fails to play up the drama between Ken and his son, only having a couple minor scenes in the first hour between the two. Even though I enjoyed the movie, I kept thinking to myself that it would be so much better if the relationships between these characters were given some of the screen time devoted to the team's practices. But thanks to Samuel L. Jackson's strong performance at the center of the film, Coach Carter serves as an intriguing look at the dynamics of contemporary athletics in urban high schools. It clearly isn't as intense a portrait as Hoop Dreams, but the story of Ken Carter's efforts to inspire his team to succeed not only on the basketball court but also in life makes for an engaging movie with heart. Image Transfer Review: The anamorphic 2.35:1 widescreen transfer is a sharp, detailed image filled with excellent contrast. I honestly didn't notice any flaws in the transfer, with colors and depth being quite strong. It's not stunning to look at, but this is because the source material doesn't provide jaw-dropping cinematography. Audio Transfer Review: There's a lot of range in the Dolby Digital 5.1 audio mix and the dialogue is always well balanced and audible. Sound separation and directionality are used well, avoiding the pitfalls of gimmicky audio manipulation. The music fills the rear-channels nicely, making this a solid listen. An English Dolby Stereo 2.0 track and French Dolby Digital 5.1 track are also available. Music Video�complete music video of "Hope" by Twista and featuring Faith Evans. Extras Review: Prior to the main menu, the previews for the upcoming remake of The Bad News Bears, The Longest Yard: Lockdown Edition DVD, Laguna Beach: The Complete First Season DVD, and Sahara are provided in either nonanamorphic 1.85:1 widescreen or 1.33:1 full-screen. 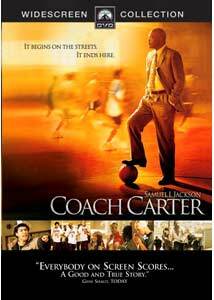 Supplemental material pertaining to the film is kicked off by the documentary Coach Carter: The Man Behind the Movie (19m:40s). Featuring interviews with the real Ken Carter and his players, as well as Samuel L. Jackson, this is a nice supplement that gives some background to the life of Coach Carter that the script does not provide. Some of the stuff about Carter's family and childhood are interesting and should have been in the movie. Following that is the featurette Fast Break at Richmond High (11m:40s), consisting of interviews with the cast, producer, and basketball coordinator about how the basketball scenes were choreographed and shot. A particularly interesting bit shows how computer technology is used to determine which camera lens to use for a particular shot. There are also six deleted scenes shown in anamorphic 2.35:1 widescreen and Dolby Digital 5.1 sound. They can be played together for a total running time of 12m:12s. Each scene is good, and both Damien Wants to Celebrate with the Team and The Team Welcome Cruz Back/Kyra Breaks Up with Kenyon might actually have been beneficial to the final product. Rounding out the extras is the music video of Hope from the film's soundtrack, sung by Twista and featuring Faith Evans. Anchored by Samuel L. Jackson's engaging performance, this release of Coach Carter features a fine image transfer and a lively audio mix. Accompanied by nice extras, this DVD should be part of your starting lineup.